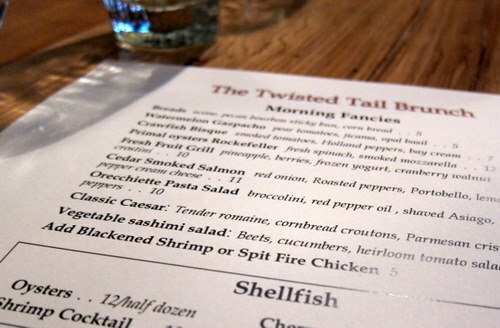 On one of our many recent rainy weekend days, we stopped by the Twisted Tail for a late brunch. They just opened in Headhouse Square and in addition to food and drink, offer live blues music and open blues jams, for those of you inclined. They’re also a bourbon house so they’ve got quite the array of liquors! They also feature a charcoal grill in their kitchen and cook most of their food over open heat, whenever possible. 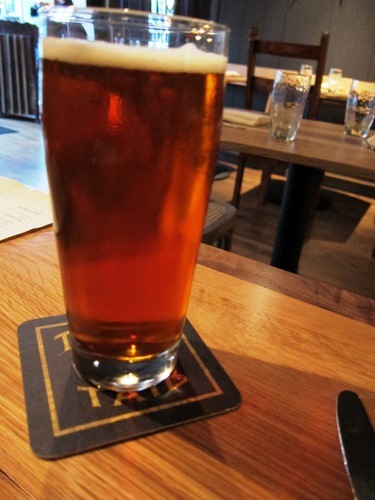 Of course, they also have beer. The restaurant is really quite big, especially the downstairs. I did not get to check out the upstairs, where the music happens. It’s decorately quite tastefully, even with all of the curly tail motif everywhere. It’s warm and masculine, with a slightly rustic touch. 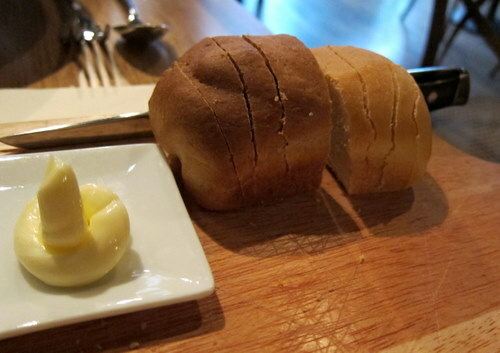 Here’s some complimentary bread, one which was a corn bread, and one which was a bourbon based bread, I think. See the curly q of butter? Yes, very cute. The corn bread wasn’t particularly corn tasting at all. I like the bourbon bread, it had a little sweetness. 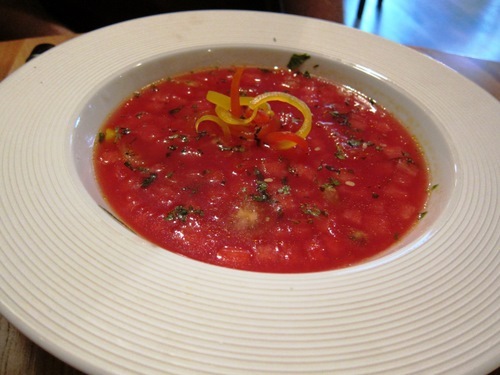 This is the watermelon gazpacho. Delicious and refreshing! It’s made with watermalon, pear tomatoes, jicama, and opal basil. It was a lovely mix of sweet and savory, with nice hunks of the fruit and veggies. It was so surprising and great. 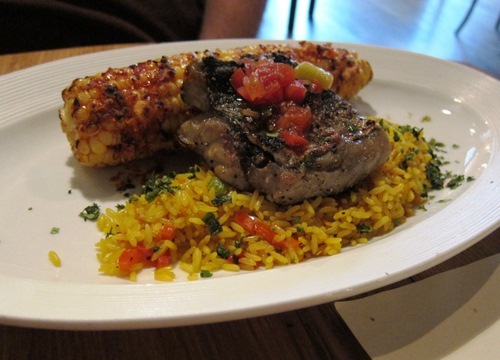 This is the grilled Jersey Blue Fish, with confetti rice, and grilled loco corn. The fish was cooked on the grill, skin on, and was moist and delicious. It had a great flavor, all on its own. The corn had some kind of bbq type of sauce on it, and while already super sweet already, had the added sweetness from the sauce. It was amazing! I had my eye on the bison meatloaf, and after our server told us it was one of his favorites, I had to go with it. It’s made out of bison! 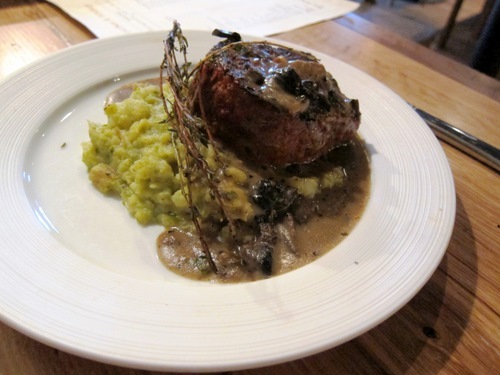 And it comes with a portobello mushroom gravy and green pea whipped mash potatoes. It was all delicious! The meatloaf has a bit of a kick from the glaze that’s on the outside. I’m in love with this green pea whipped mash potato stuff. It’s chunky and has tons of potato skin in it and pea bits. I just loved it. For dessert, our server recommended the Chocolate Symphony. Why the hell not? 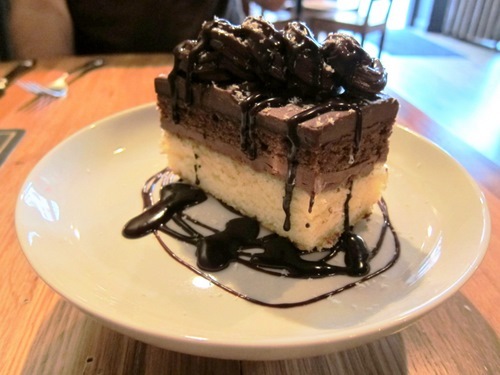 It’s a layer of white chocolate pound cake, layers of chocolate mascarpone, a layer of German chocolate cake, and topped with Godiva sauce. They put the sauce on at the table, so you can get as much as you want. So go all out people, go crazy! This thing is nuts! It’s incredibly dense, sweet, chocolatey, and way too much for a weakling like me. I was done after a few bites. But it’s everything you’d think it would be. This was a great meal. Neither of us had any kind of idea what this place would be like. It’s brand spankin’ new and in a location that seems to be fraught with closings. Well, we hope this place stays around for a long time. The food was great and so was the service. Especially the service!